Marie Brennan describes herself as a "former academic with a background in archaeology, anthropology, and folklore, which she now puts to rather cockeyed use in writing fiction." 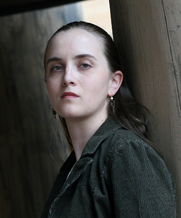 She's the author of Doppelganger and Warrior and Witch, among other books. Her latest book is A Natural History of Dragons: A Memoir by Lady Trent, published in February by Tor Books. Tell us about Lady Trent, the narrator/memoirist of A Natural History of Dragons. What's she like, how does she get interested in dragons, and what can readers expect from her memoir? She's a deeply geeky woman who became obsessed with dragons at a young age, when she began collecting sparklings (tiny insect-like draconic creatures) and decided that anything with wings was awesome. Her memoirs chronicle the process by which that enthusiastic girl became first an amateur naturalist, then a professional one, then a rather famous (not to say notorious) one. As she is writing her memoirs in her old age, she doesn't much care what people think of her anymore, and often has trenchant comments to make both on society and her own youthful errors. Your own background is in anthropology, archaeology, and folklore, all of which certainly come into play in A Natural History of Dragons at various points. What shifted you away from academics and into fantasy writing? Oh, the fantasy writing came first, by a long shot. I knew I wanted to be a writer by the time I was ten, and didn't settle on going to graduate school until I was in my junior year of college. Given that what I studied in grad school was science fiction and fantasy literature and community, the two things never drifted very far away from one another. But it's true that I did eventually leave grad school to write full-time. That happened because of the convergence of several things. Just when I'd finished my coursework and needed to start preparing for my dissertation, I sold my first novel, which moved writing from "hobby I want to earn money at someday" to "active and ongoing career." My dissertation would almost certainly have hampered my ability to build that career. Then, while I was in the process of considering that, the company my husband worked for went bankrupt, and it became clear that we should move to where his job prospects would be better. I still have a strong interest in academic topics, which (as you said) feed into my writing, just as the writing once fed into my academic interests. I just swapped which half is in the "hobby" category, and which half is my job. Lady Isabella frequently mentions her own earlier works as well as other reference books she reads as part of her research. Have you given any thought to fleshing out the story by writing any of those books as well? I've considered writing excerpts from them at some point, as a sort of "DVD extra" for the series. I wouldn't write the whole books, though—I don't think they would actually be interesting at great length, as many of them are very dry scientific treatises. I'm also tempted by the notion of writing short stories in this setting, that aren't from Isabella's point of view. Some of them might give an outside perspective on her, to contrast with her opinion of herself in the memoirs, while others would develop secondary characters or different parts of the world. None of those have yet gotten past the vague-idea stage, though; the novels have been taking up too much of my time and energy! I have a home office, and that's where 95% of it gets done. Mostly I work late at night; for whatever reason, my brain seems to really turn on around 10 p.m., and go until as late (or early) as 3 a.m. The result is that I keep rather odd hours, and have to explain to people that it isn't laziness for me to sleep until 10 or 11 a.m. Which authors or books do you find yourself returning to most often? I have a deep and abiding love for Diana Wynne Jones, whose work I have loved since childhood; one of her books, Fire and Hemlock, was the catalyst that made me decide I wanted to be a writer. She's a splendid example of how a truly good storyteller can speak to both children and adults. As for organization, fiction is downstairs, with mass-market paperbacks in one bookcase (with very closely-spaced shelves) and hardcovers and trade paperbacks on another. Those, of course, are all alphabetized by author. There are two bookcases with comic books and roleplaying games, and then in my husband's office, various science and technical books. My office contains the nonfiction part of our library, arranged by subject, along with odds and ends like the travel books, foreign language dictionaries, manga, and so on. It sounds a bit obsessive, but with more than two thousand books, we'd never find anything if it weren't organized. You've written about the importance of buying books from physical bookstores: what are some of your favorite bookstores, and why? I love Borderlands Books in San Francisco. It's a specialty bookstore, with science fiction and fantasy and horror, and its selection is fabulous. They host a large number of readings and signings and other events, and the staff are very knowledgeable and friendly—basically, it has all the classic virtues of the independent specialty store. I was surprised by how much I enjoyed Lia Habel's Dearly, Departed—not because I had any doubts in Habel as a writer, but because I usually have zero interest in zombie books (or zombie films, for that matter). Hers avoids a lot of the standard tropes of the genre, though, and goes off in its own, highly entertaining direction. I especially appreciated the way the romance plays out, in contrast with the borderline abusive behavior often associated with paranormal boyfriends. Presumably there's a second Lady Trent memoir in the works? Can you give us any hints about what she'll be up to in the next volume? Do you have a plan yet for how many volumes the series will eventually contain? I'm currently under contract for three volumes in the series; I hope to make it five in total.